The renowned Swingline 747 Stapler is built with all-metal construction for dependability and strength. This sleek, steel gray stapler adds style to any desktop. A specialized inner rail delivers reliable, jam-resistant stapling. Stapler holds a strip of up to 210 staples. A handy low-staple indicator alerts you when it's time for a refill. 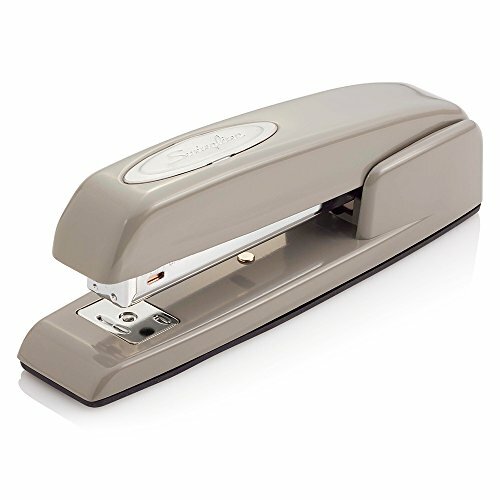 This stapler secures up to 25 sheets of paper and works best with standard sized Swingline S.F. 4 Premium Staples. While generally designed for desktop use, the 747 stapler is also great for tacking and pinning. It's easy to tack papers onto a bulletin board, telephone pole, or other vertical surface—simply open the stapler 180 degrees by pressing a release at the bottom, and you're ready to tack. This stapler also easily produces pointed staples for temporary pinning. Reverse the anvil by pushing and rotating the adjustable knob at the bottom and press. Swingline backs this stapler with a 100% performance guarantee and a limited lifetime warranty. ICONIC METAL STAPLER - Sleek, steel gray stapler with all-metal construction is designed for durability. A specially crafted inner rail delivers jam-resistant, accurate stapling you can count on. DESIGNED FOR DESKTOP - The 747 stapler is intended for desktop use. It holds a full strip of 210 staples. The helpful low-staple indicator lets you know when it's time for a refill. SECURES 25 SHEETS - This high-performing stapler fastens up to 25 sheets of paper and works best with standard Swingline S.F. 4 Premium Staples. Standard staples have ¼" length legs. TACKING & PINNING - Tack papers to bulletin boards with ease: unlatch the stapler and you're ready. The stapler can also produce pointed staples for temporary pinning: just reverse the anvil. BUILT TO LAST - Swingline stands behind this classy red stapler with a 100% performance guarantee and a limited lifetime warranty.